When looking after the water in mini pools and smaller temporary pools there are special conditions that have to be considered: Small pools need smaller amounts of care products and in most cases they have a filtration system that uses filter cartridges. 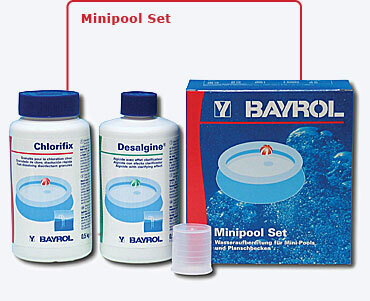 This is why BAYROL makes care products specially designed for small pools. 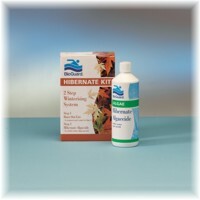 Amazing Value Chlorine-Based Water Care Product For Small Pools, With Algicide. 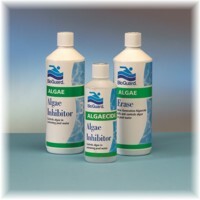 Contains 0.5 kg Chlorifix For Rapid Disinfection And 0.5 Litre Desalgin For Algae Prevention. Use Approx 50 Grams Of Chlorifix Per 10,000 Litres Per Week. 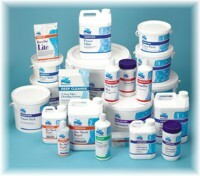 The Spa range of water treatment products has been developed to help you make owning your spa a simple pleasure. 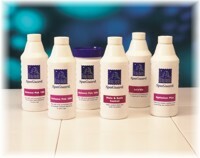 Creating and maintaining good quality Spa water is not achieved by the addition of chemicals alone. At Simpsons Spas we have a full water testing facility so we can better advise you on the best chemicals for your particular system. We not only supply and fit spas we are here to help you maintain and have trouble free ownership of your spa. Every day, bacteria and other contaminants can find their way into your spa water. Proper circulation will prevent these contaminants from becoming a problem. As water circulates, it passes through the filter, which traps suspended particles. Circulation will also ensure thorough distribution of the chemical products that kill bacteria and eliminate undesirable compounds. Most spa problems are caused by poor or insufficient filtration. A filter that is operating properly helps keep water clean by capturing the suspended particles. When the filter is dirty or clogged, the filter’s efficiency and water circulation will be adversely affected and the water quality will deteriorate becoming dull and lifeless. Most domestic spas have a cartridge filter. Check your owner’s manual for detailed information on how to remove the cartridge element for cleaning. Typically, you should clean the cartridge every 4 – 6 weeks. If left unchecked, contaminants such as dirt, oil and even bacteria can accumulate at the waterline, much like a bathtub ring. Regular cleaning of the spa preserves the surfaces so the whole spa environment looks and feels better. It is also important that you have and use an accurate test kit for checking pH and sanitizer levels. These tests should be undertaken daily to ensure that your spa water is safe and comfortable to bathe in. Within the range we offer water testing apparatus that are quick and easy to use.